Motor insurance is probably the type of insurance that we are familiar with the most. It is after all the largest insurance class in Malaysia. It is not surprising since motor insurance is made mandatory by law and that the number of new vehicles registered in the country has been steadily increasing every year. With so many cars around, accidents are bound to happen. As a matter of fact, they don’t just “happen”, they have become a norm here in Malaysia. In 2014 alone, there has been over 470,000 cases of accidents resulting in over 6,600 road deaths. But what about car theft? Since we are talking about motor insurance, we should also touch on the reality of car theft in the country. In 2014, it was reported that a total number of 34,117 cars were stolen, a slight decrease from 37,020 the previous year. These numbers give us an idea of how often a theft and/ or accident may occur and we could be part of the statistics too no matter how careful we are. It is always best to have a plan B. And in this case, plan B could be in the form of a Motor Insurance. To put it simply, a motor insurance is a policy that covers your vehicle in the event of an accident, theft, and damages. There are 3 main types of motor insurance offered by any insurance company, in Malaysia and elsewhere, though the terms and coverage may differ slightly from company to company. Third Party plan is the most basic motor insurance coverage you can find offered by any insurer. Its coverage is limited and therefore premium is the lowest compared to other policies. In Malaysia, it is mandatory to have at least a Third Party plan if you own any motorized vehicle, including motorcycles. 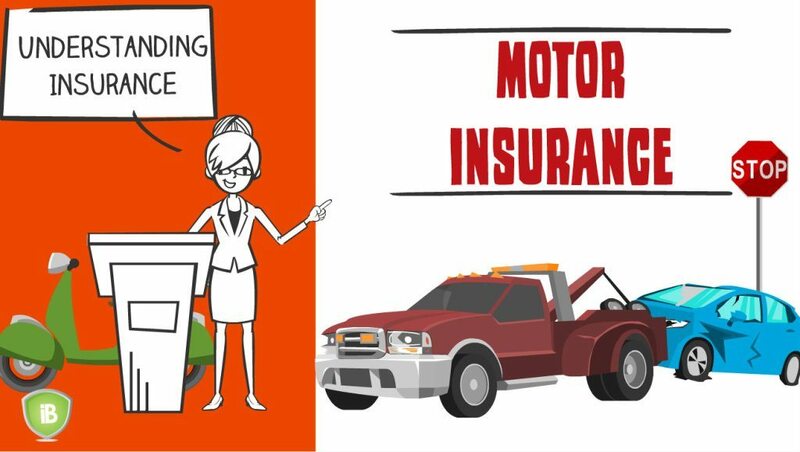 The moment a vehicle is purchased, you are required to buy also a motor insurance plan for your new vehicle, without which it will not be allowed ‘on-the-road’. This plan covers you against third party (other person/ people) claims against injuries or death caused to them. It also covers against losses or damages to the third party’s property caused by your vehicle. 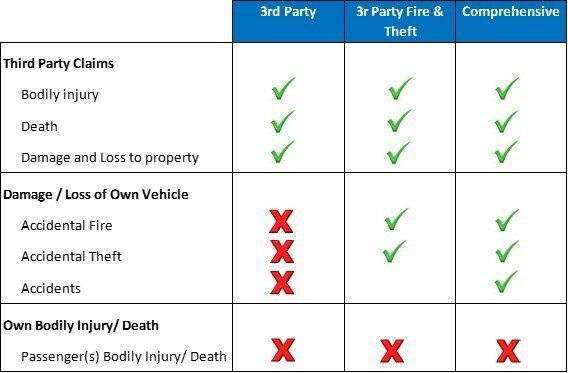 Third Party Fire and Theft policy, as the name suggests, covers a little more than just a third party claim. What does Third Party Fire and Theft Insurance cover? Apart from insuring you against third party claims against injuries or death and losses or damages, this policy also covers your vehicle against damages or losses due to accidental fire and theft. What does accidental fire and theft really mean? Comprehensive coverage offers the widest coverage for motor vehicles. In Malaysia, if you have purchased a car with a bank loan, you will be required to purchase this insurance coverage for the new car. Comprehensive insurance policy not only covers you against all claims mentioned in previous two policies, but it also insures you against loss and damages on your own vehicle during an accident! When to get Comprehensive Cover? The usual advice that you will hear is that if you have a brand new car or a very expensive or a luxury car, you may want to purchase a Comprehensive Coverage for your vehicle, as the repair cost for these vehicles is not cheap. Therefore, you might want your insurance policy to foot the repair bill instead. However, if you own a cheaper model or an older car, and you might not care about a few dents from a fender bender, or where you know the repair would not cost your entire savings, then you might want to stick to third party insurance. It is extremely important to understand that none of these policies cover against your own injury/ death or the injury/ death of your passenger.